This pic was what I had to go on, on the auction site. 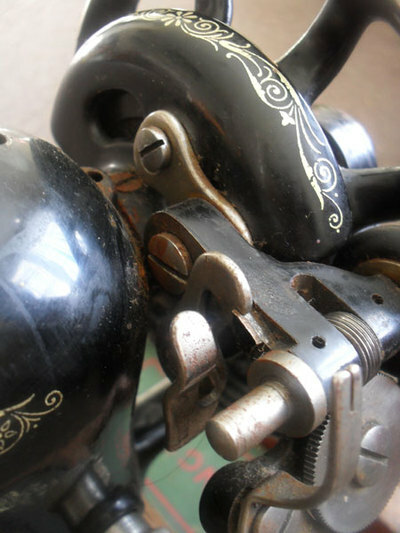 The reproduction cranks have plastic knobs. This one is wood - real, authentic, original. (I'm really not snobby - I would buy a repro if I needed/wanted to). It arrived and I was able to have a good look at it. Twiddled and fiddled. She was siezed solid. No movement when turning the balance wheel. The guy I bought it from, seemed a little concerned at my intentions, re-iterated its stuck-ness and wished me luck. 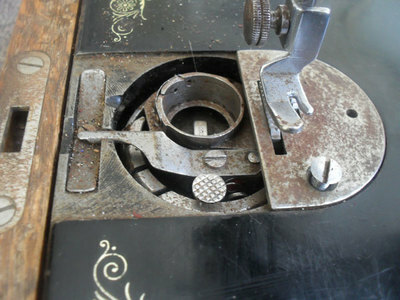 Was only missing a bobbin cover - everything else was there. (I knew because I had been reading). I was a little scared - and thrilled. 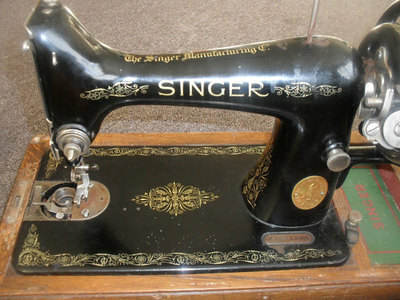 Made at the Singer Kilbowie Factory, Clydedale, Scotland. 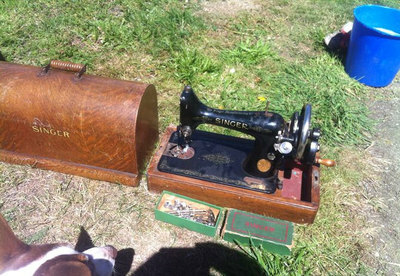 Singer 99s are good to play with, because they are plentiful - you can pick them up for next to nothing. 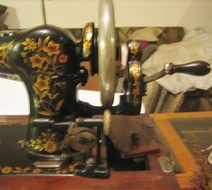 They are three quarter size - not as big as the sister treadles. You can get bits for them - parts are interchangeable. I was now at the stage where I could recognise certain models from photographs. It was time to roll my sleeves up and get to it. Man, I'm glad I can read. I have a Jones handcrank, my hubby bought it for me for Christmas one year.